We are on Fire for Marriage! Are You? We are on fire about the institution of marriage. What do we mean by that? Well, we believe marriage is a sacred covenant entered into before, and blessed by, God. We believe marriage is the foundation of a family, and if healthy, will enrich each family member in enumerable ways. We believe the beauty of marriage is, we choose it and if we feed and nurture it, it will not only work, but thrive. Quite simply, to us Marriage Rocks! His Repeated Infidelity Has Hardened My Heart. What Do I Do? My Husband May Be An Addict. Help! Join and get exclusive access to MR news, discounts and giveaways. 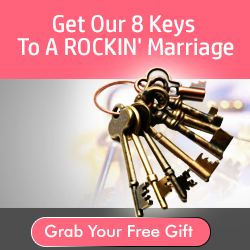 You'll also gain access to our 8 Principles to a ROCKIN marriage.